I just found out that a buddy of mine took first place in the No Mo Fishing Tournament for Largemouth Bass. The competition focused on kayaks and other hand powered craft, fishing for both Large and Smallmouth Bass as well as Striper. Congratulations to him, hopefully I can get an update from him and post more on it soon. As a follow up to my posts on Blue Mesa and using local knowledge to catch fish, I wanted to talk a little about salmon fishing specifically. As I mentioned before, I had never fished specifically for salmon, even though I had fished at some of the other Colorado lakes that have Salmon, such as Taylor, Eleven Mile and Clear Creek Reservoir. You can read my previous post about using local advice here. Getting the opinions from a local guide, the marina and other anglers got us catching fish much quicker than trying on our own. Here is some of what we learned about the Kokanee Salmon on Blue Mesa Reservoir. First off, Salmon are typically found in schools. We marked a lot of fish around Blue Mesa, but most of our actual Salmon hook ups resulted in traveling through large groups of fish. We would troll until we found a school, then we would try to hit it from several different directions and if we weren't getting bites, we would switch up our lures and depths. An Assassin, workhorse of Salmon fishing. We also noticed that the Salmon liked to suspend over deeper water, but not necessarily the deepest water around. We were having problems with our fish finder, so we weren't getting good signals when the water depth exceeded about 120 feet. As a result we typically fished over water that was 60-90 feet deep. The salmon that we were seeing and catching were typically between about 15-30 feet deep, suspended over about 70-90 feet of water. One of the best pieces of advice that the guide gave me was not to use any one lure for too long. He said that the Salmon would hit on almost any lure, but not all at once. He suggested using a lure for no more than about 15 minutes without a bite. We didn't always switch every 15 minutes, but we did try to switch them up when we were getting bites. We noticed that several times we hooked fish within a minute or two of switching to a new lure, or just changing colors. While I certainly wouldn't consider myself an expert in Salmon fishing, I did learn a lot on that trip. I am hoping that I will be able to make a trip down to Blue Mesa once a year or so. We brought home quite a few Salmon fillets. We vacuum packed them and put them in the freezer. We've already enjoyed them baked, fried and made into Salmon patties, we are looking forward to making new recipes, or maybe making our Smoked Salmon again. ﻿﻿﻿﻿We recently decided to upgrade the very basic fish finder that was on our pontoon boat when we bought it. We were finding that in deeper water, such as Blue Mesa Reservoir, we didn't have enough power to get a view of the bottom. A trip to Bass Pro showed us that what we were wanting to spend was not going to give us a lot of options. We didn't really want to spend $500 + as we felt like we couldn't justify it. After looking awhile, the rep that was helping us mentioned that he did have a discontinued model that had been on sale before, the unit was a Humminbird 768 that normally lists for $500. He honored their previous sale price, so we were able to get it for $200! We will be installing it soon and I will try to write up a review of the unit when we do. Let me know in the comment section below what fish finder you use and what you think of it. It's time for me to plan another fishing/camping trip. This time we are headed to Taylor Park Reservoir. For those of you that aren't familiar with Taylor, it is located north of Gunnison and west of Buena Vista. It is a beautiful drive from Buena Vista, over Cottonwood pass, which runs directly through the collegiate peaks. Taylor reservoir itself offers fishing for Rainbow Trout, Brown Trout, Cutthroat Trout, Lake Trout, Kokanee Salmon and Northern Pike. Fishing on the lake is completely free, there are no access fees or boating fees to access the lake. There is also a marina that offers boat rentals, equipment sales and rentals and there is even a small food stand in front of the marina. Nearby camp sites, plus plenty of national forest roads for four wheelers and dirt bikes. The lake and ramp are free to use, camping may have associated fees. Before going you can check out the marina website here﻿. They have a phone number listed if you want to call for conditions before going out. Thanks for all the support, I'm looking forward to getting some follows. Have any ideas for articles or posts? Let me know in the comment section below! Learning From The Locals- Tips To Maximize Your Fishing Success. 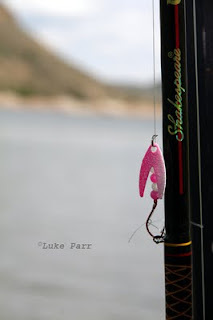 If you've been following my blog, or have seen some of my recent posts, you would know that I recently went to Blue Mesa Reservoir for five days of camping, boating and fishing. This was my first time at Blue Mesa since I was a small kid and the first time I had ever gone out on the lake in a boat. I had been doing a lot of research on www.fishexplorer.com, trying to figure out where the fish were biting and what they were biting on. I was particularly interested in fishing for salmon. I had never caught a salmon before and wanted to get as close to my 10 fish limit as possible. The Fish Explorer website had a lot of good information, but I made one big mistake, when they mentioned lures that I hadn't used before, such as Assassins and Wedding Rings, I kind of ignored those suggestions and only payed attention to the lures that I was familiar with, such as Kastmasters. The first day and a half of fishing showed that I had not payed enough attention. Between four adults fishing we managed to bring two rainbow trout to the boat and lost another at the net. Not exactly what I would call a productive trip. When we came back to the dock for dinner I decided to stop by the marina and ask what was working, they again mentioned the Assassins, as well as squids, all behind a dodger. I also got a chance to talk with Robby from www.sportfishcolorado.com. He was just coming off the water. He gave me some great tips, not only on what to use, but what depths and where in the lake to try fishing. Using the advice from Robby and the marina I bought a small selection of Assassins and squids from the marina, I also bought a dodger for both of my leadcore lines. We also decided that instead of putting the boat in at the Elk Creek ramp, we decided to move to the Lake Fork arm, most of the people we talked to, including other vacationers, indicated that more people were having success in the Sapinero basin, which is accessed by the Lake Fork boat ramp. We only had a few hours left to try the new lures and advice that we had received. Even though we were still getting used to the new lures, I managed to land my first three salmon of the trip. Now that we felt like we knew what we were doing, we hit the lake the next day ready to catch more salmon. We tried the different lures and different colors throughout the day. One of the best pieces of advice was to switch up lures if we hadn't received any bites after about 20 minutes. Between two leadcore lines and and a downrigger we didn't have enough lures to completely switch out more than two or three times, so we didn't always follow the 20 minute rule. We did, however, notice that the salmon seemed to like one color at a time and it often switched. We would have an hour or so where a pink Assassin would be getting all of the bites, then all of a sudden it would stop. After switching some colors around we would find that something else was suddenly working. Overall, we had a much better experience once we actually took the time to talk to some locals and see what had been working for that lake at that time. If we had continued to use the methods we were used to, we would have probably continued to be frustrated by catching a few fish and possibly never catching the fish we were really interested in, salmon. Most of us have a favorite fishing spot, where we know that certain lures will almost always work. When you are at a new lake, take advantage of some of the intimate knowledge that the locals have. Just like with us, you may get some tips that put you on to the fish, rather than waiting and hoping that your standard methods will eventually produce some fish.